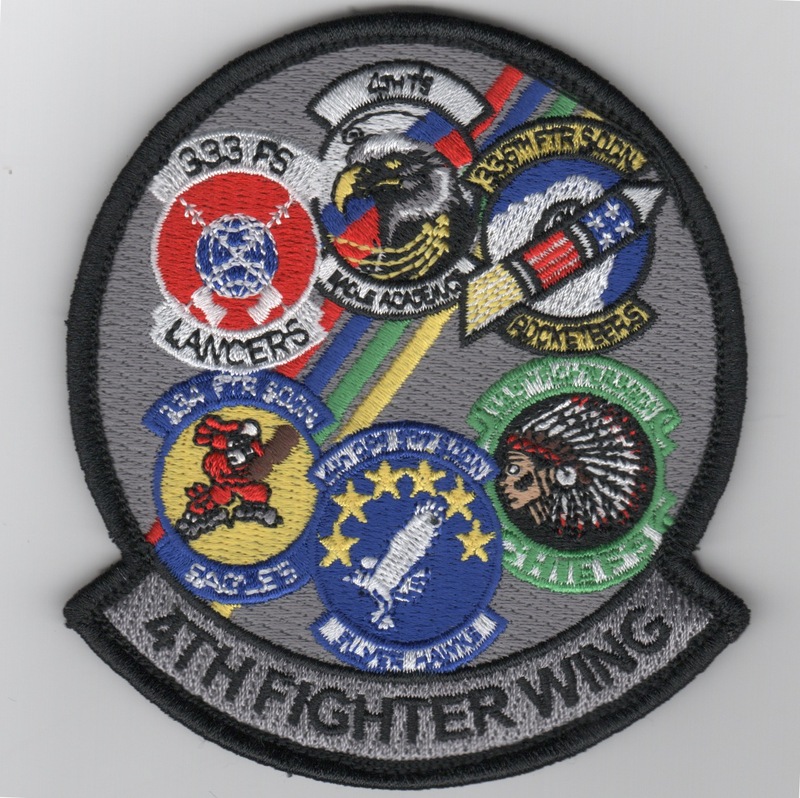 The 4th Fighter Wing is a United States Air Force unit assigned to the Air Combat Command Ninth Air Force. It is stationed at Seymour Johnson Air Force Base, North Carolina, where it is also the host unit. The wing is one of two Air Force units that can trace its history to another country. The wing's 4th Operations Group had its origins as the Royal Air Force Eagle Squadrons (Nos. 71, 121 and 133 Squadrons). When the US entered World War II, these units, and the American pilots in them, were transferred to the United States Army Air Forces VIII Fighter Command, forming the 4th Fighter Group on 12 September 1942. Since I was in the 4FW, I took it upon myself to recreate our historical wing patch. This is a reproduction patch, but is very nicely done. It says "FOURTH BUT FIRST" (our mantra) along the bottom and does not come with velcro attached. This is the color version of the crest patch for the 4th Fighter Wing, the controlling authority for the F-15E Strike Eagle squadrons located at Seymour Johnson AFB, NC. This patch does not have velcro attached. This is the color version of the crest patch for the 4th Fighter Wing, the controlling authority for the F-15E Strike Eagle squadrons located at Seymour Johnson AFB, NC. This patch does have velcro attached. (An AV8RSTUFF Creation): Created back in 1997 during the 50th Anniversary of the USAF, this patch has a "golden arrow" on the 4FW crest which is the controlling authority for the F-15E Strike Eagle squadrons located at Seymour Johnson AFB, NC. This patch does not have velcro attached. This is the color version of the heritage patch for the 4th Fighter Wing, the controlling authority for the F-15E Strike Eagle squadrons located at Seymour Johnson AFB, NC. 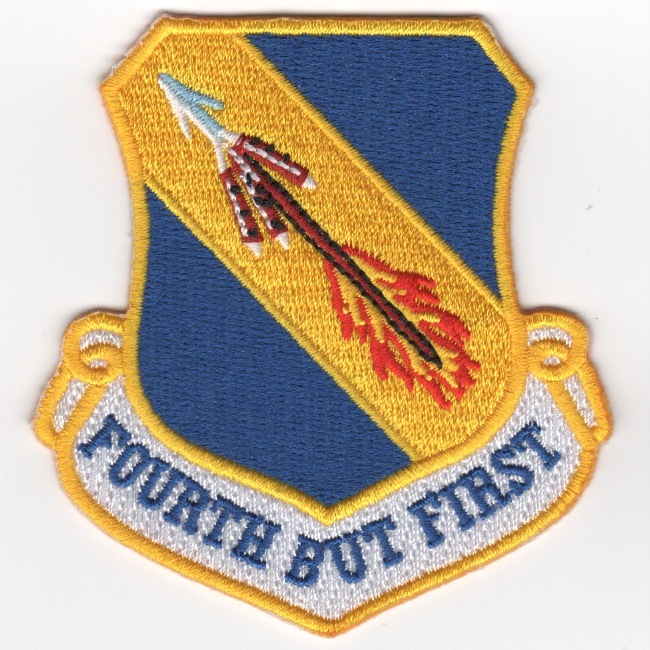 This is the current color version of the 4th Fighter Wing's "GAGGLE" patch, the Fighter Wing for the F-15E Strike Eagle squadrons located at Seymour Johnson AFB, NC. This patch does come with velcro attached. 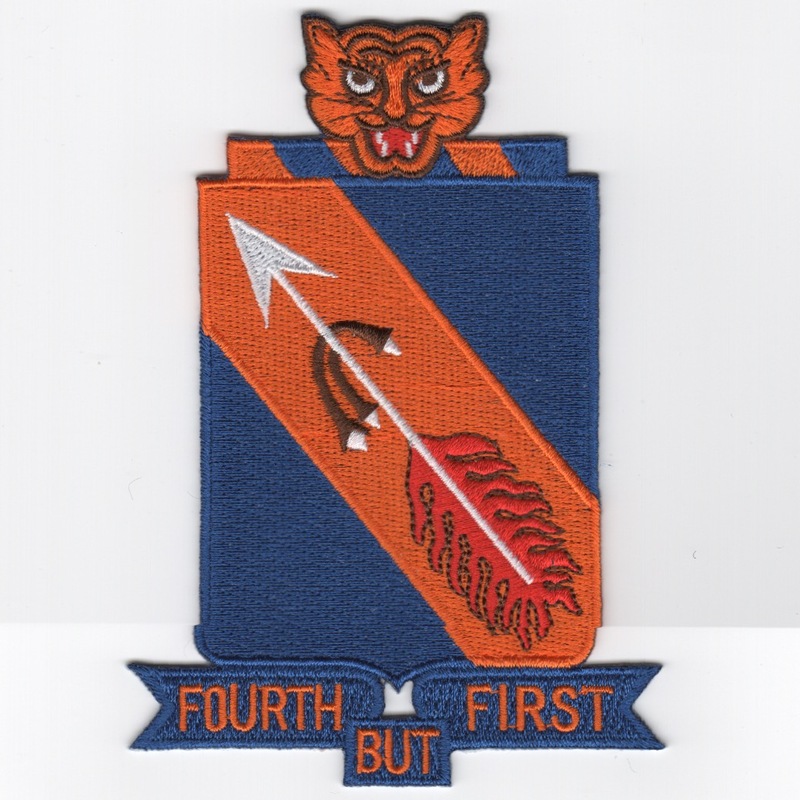 This is the current color version of the squadron patch for the 4th Fighter Wing's Operational Support Squadron, the supporting squadron for the F-15E Strike Eagle squadrons located at Seymour Johnson AFB, NC. This is the current color version of the squadron patch for the 4th Fighter Wing's Training Squadron, the training support squadron for the F-15E Strike Eagle squadrons located at Seymour Johnson AFB, NC. They conduct, and are responsible for, all the "training" syllabus' for the F-15E RTU's. This is the color version of the 4th Fighter Wing Air Expeditionary Wing patch for the two operational F-15E Strike Eagle squadrons located at Seymour Johnson AFB, NC. 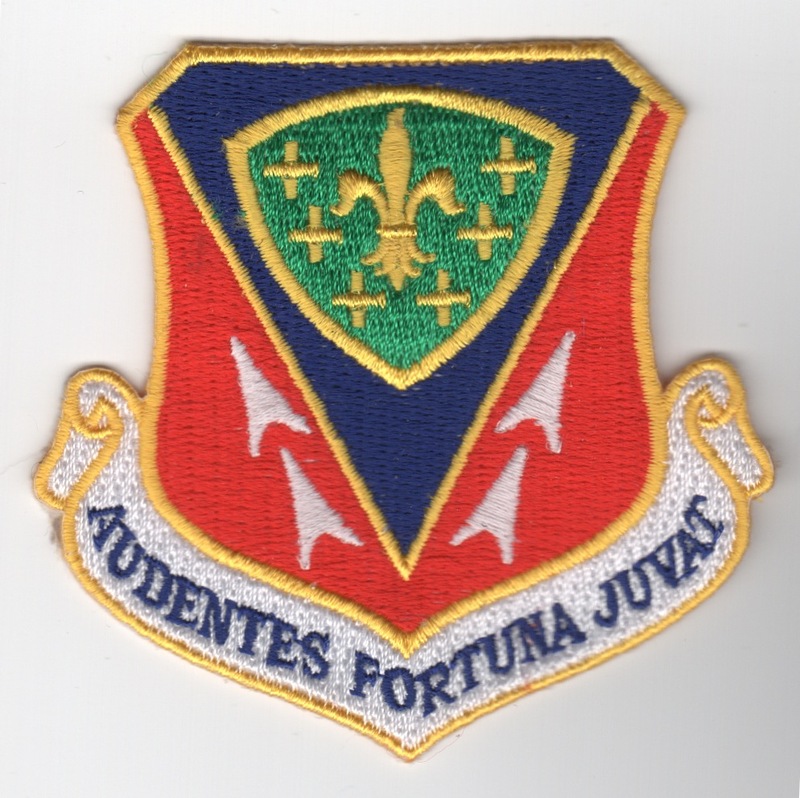 This is the color version of the 48th Fighter Wing crest patch showing the Statue of Liberty. This patch does NOT have velcro attached. 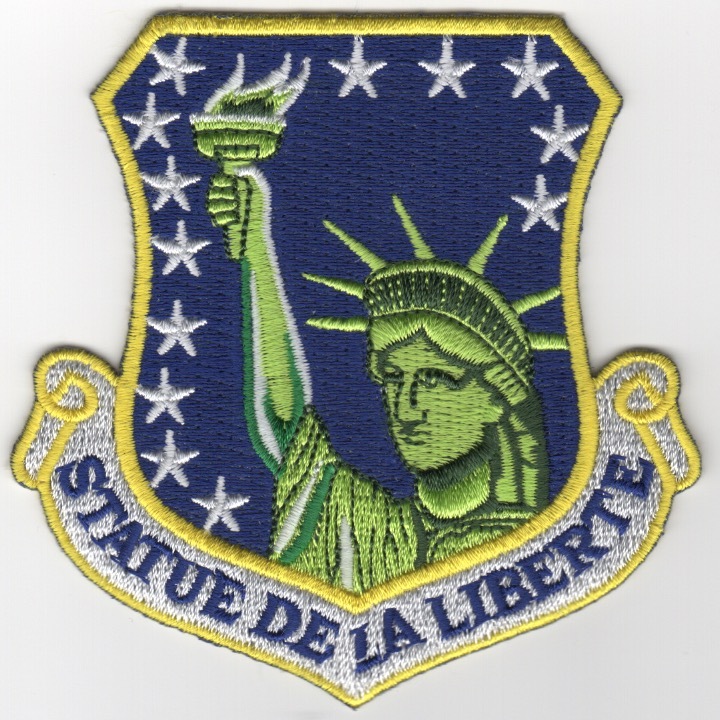 This is the color version of the 48th Fighter Wing crest patch showing the Statue of Liberty. This patch DOES have velcro attached. The 366th Fighter Wing is home to three fighter squadrons: the 389th Fighter Squadron and 391st Fighter Squadron flying the F-15E Strike Eagle aircraft and the 428th Fighter Squadron which flies the Republic of Singapore Air Force F-15F (aka F-15SG). Until September 2010, a fourth squadron, the 390th Fighter Squadron flew the F-15C Eagle in an air superiority mission. They are based out of Mountain Home, ID and this patch does NOT come with velcro already attached. Homepage | Order F-15E WING Patches!